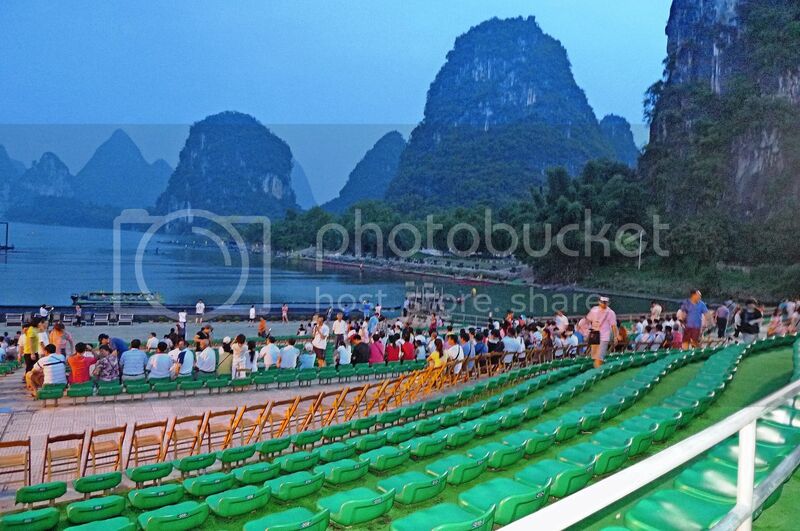 My long running Guilin travel posts will be coming to an end soon. Many of you may be heaving a sigh of relief and I don't blame you haha! But I have to thank all of you readers for sticking with me and religiously following my Guilin travels that spanned 10 days but incredibly took me more than one year to complete blogging about it! Today I am going to take you to my Day 6 in Guilin where I was in Yangshuo to attend one of the most amazing live performances in the world that I have ever seen! 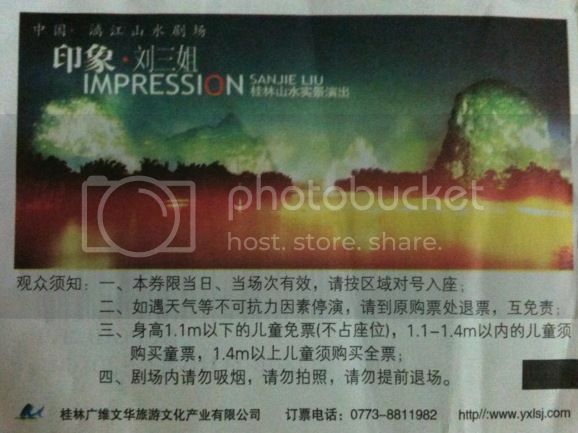 Yes, it's the Impression Liu Sanjie show! Just to reflect a little on what my travel partner Jam, his friend and I did on Day 6, we went for the amazing Yulong River Rafting in the morning, came back in the afternoon for some rest, then went out for dinner at Mei You Cafe before going for the Impression Liu Sanjie show. We were offered VIP tickets at 238 yuan each which include transport to the show and back by the boss of Xi Jie Youth Hostel where we stayed. It was pretty reasonable so we accepted the offer. 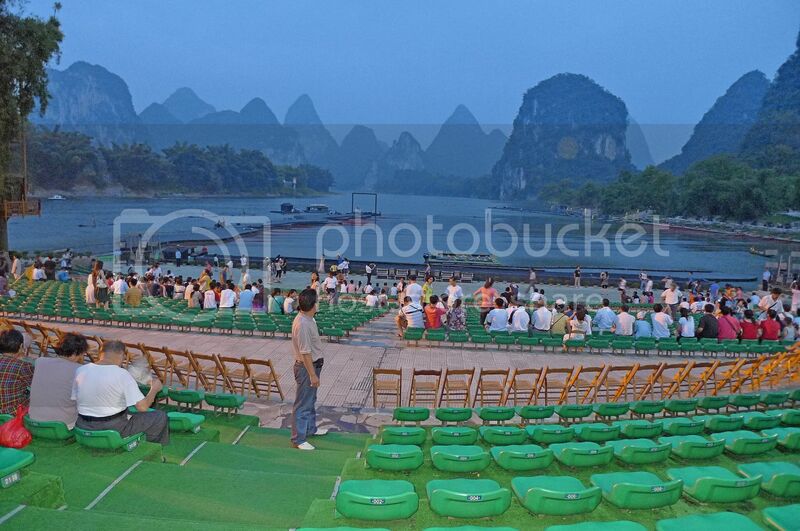 Impression Liu Sanjie is performed at the Li River Landscape Theatre, one of the first of its kind in the world, located at the junction of the Li River and Tianjiahe River, facing Shutong Hill across the water. Yes, it is the biggest landscape theatre in the world with natural settings of river and mountain karsts as the background! When I was first entered the seating area, I was amazed by the beautiful landscape! This must be the first time I have ever seen a stage built on a river with real nature as the backdrop. Honestly, I was more than impressed. I was in awe! It was still early and there many empty seats but not for long! The show started punctually at 8pm which kind of surprised me. Due to the darkness, I am afraid I could not take very good photos to show here. Besides, my camera did not have powerful zoom features and I could not magnify the performers on stage. These were the best I could come out with. Can you see the fishermen pulling the red long cloths to symbolise fishing nets? Impression Liu Sanjie is based on the famous movie "Liu Sanjie" produced in 1961. Liu Sanjie or Third Sister Liu is actually a woman from the Zhuang minority group who was both beautiful and possessed a good singing voice. But in this Impression Liu Sanjie, it was more about a series of impressions derived from the daily life of the people living around Li River rather than following the specific details of the story as depicted in the movie. It started with the Red Impression which represents folk songs. Then came the Green Impression which represents homeland. 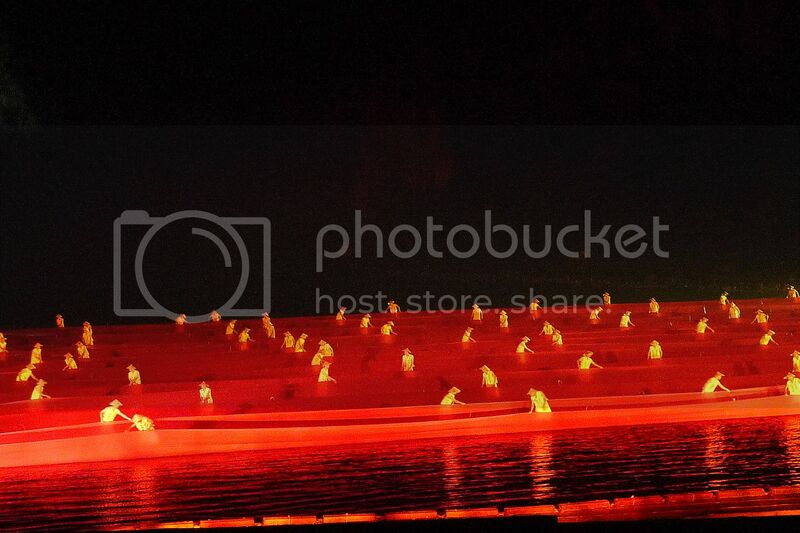 After that, was the Golden Impression which represents lights on fishing boats. Two more impressions came after that, namely the Blue Impression to represent love songs, and Silver Impression to represent grand ceremony as a closing to the show. It's just too bad I could not take good quality pictures here so I am not able to show you the images of each impression of different colours. Besides, I myself got mixed up as to which scene was for which impression, so well.....! 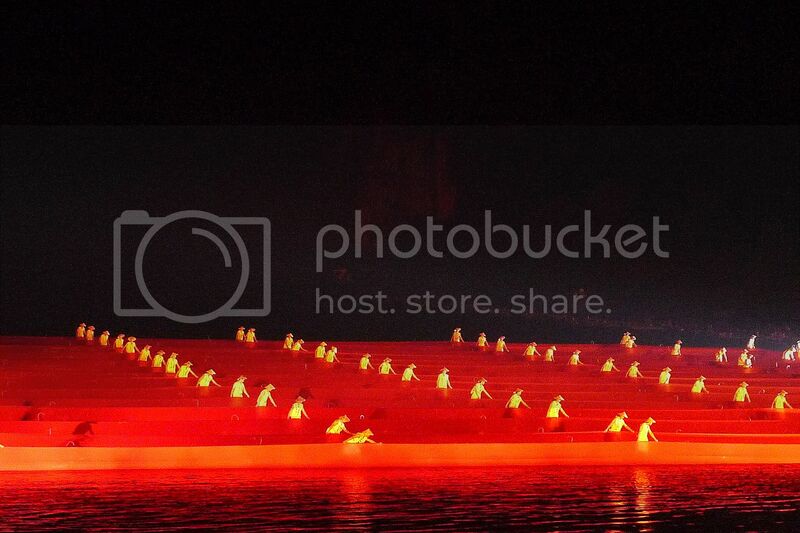 The stage was turned into one huge grand performance with over 600 performers! There is only one word to describe it - Awesome!! During the Blue Impression, these female performers (below) were seen shedding off their clothes. Really, no kidding!! But were they really naked? I don't know! What do you think? The Silver Impression was quite unique and outstanding. The performers came out dressed in clothes with lights! The lights would change colour and at certain point, some of the performers switched off their lights creating the impression that they had disappeared! This display of lights on the performers' clothes created patterns of lights that were both a marvel and delight to watch!! The roughly 70-minute show was one of the grandest and most impressive live performances I have ever seen in my life! 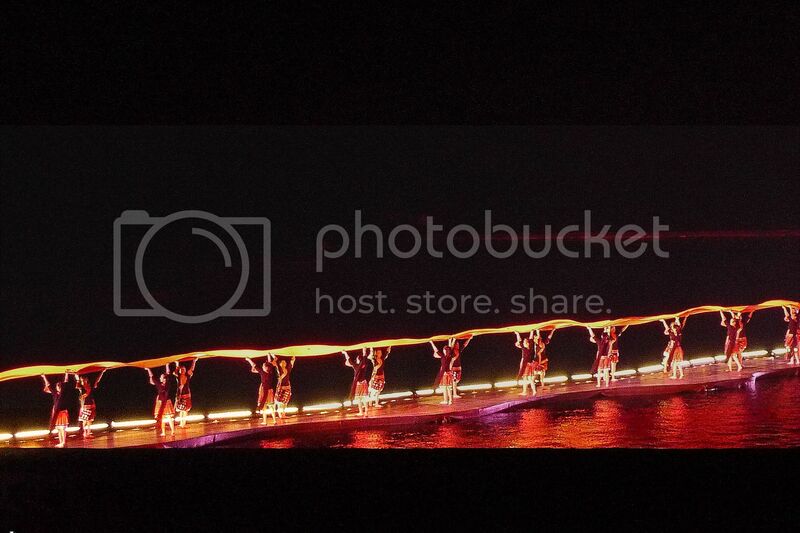 And it sort of reminded me of the grandness of The 2008 Beijing Olympics opening and closing ceremonies!! Which is not surprising, since Impression Liu Sanjie was directed by none other than the famous Chinese director, Zhang Yimou, who also directed the 2008 Beijing Olympics opening and closing ceremonies. 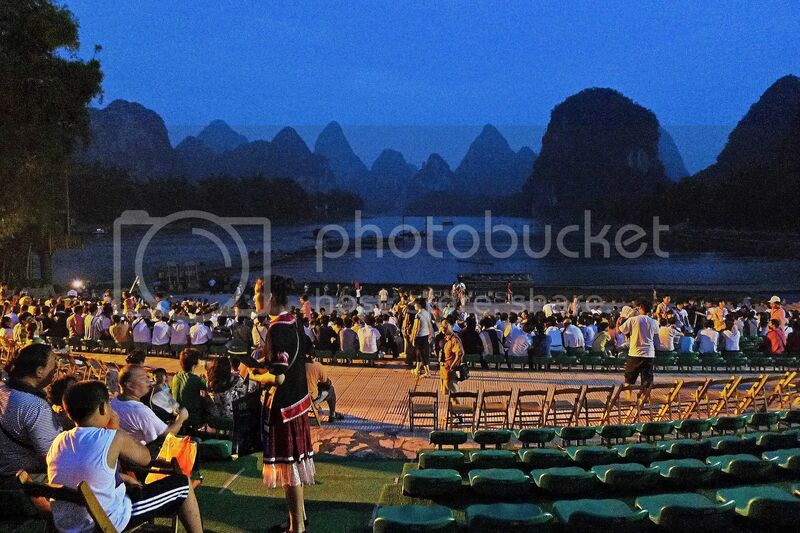 If you ever visit Yangshuo, don't ever miss this show. I highly recommend it! On my way out after the show, I caught sight of this. 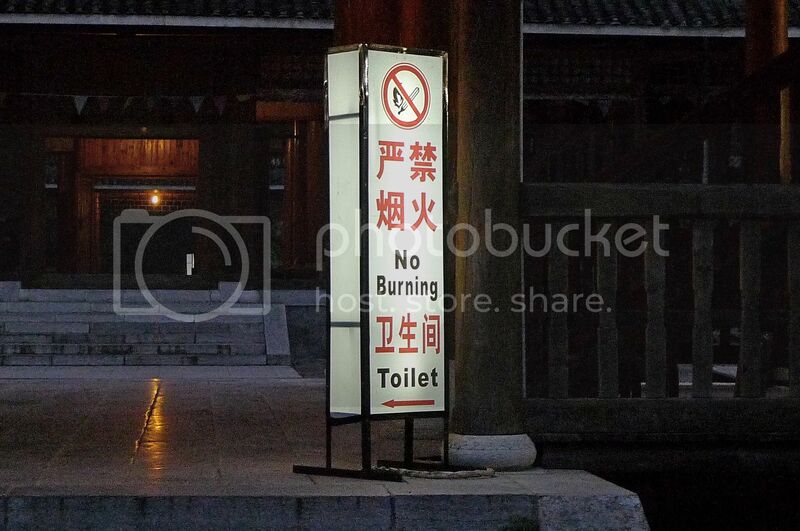 No Burning? Haha!! about the toilet... burning??? oh, maybe we chinese like to say BOMB!! Incredible backdrop for such a mesmerizing show! Thanks for sharing, Foong. Yes, the Beijing Olympics come to mind..
Yea. I could hear every time you messed up." I didn't notice it as he said it, but the more I thought about that comment, the more vengeful and jealous it sounded to me. Wah! Wah! Wah! Wah! Wah! The background is really naturally fantastic! Zang Yimou is of course world famous and i respect him. The show made me proud of our Chinese culture and multi talents! You must have looked like a VIP to get VIP seats! I believe more locals watched the shows than tourists! is that true? the girls are naked at Impression Liu Sanjie?? where? lol @ No Burning? ahahahha!! 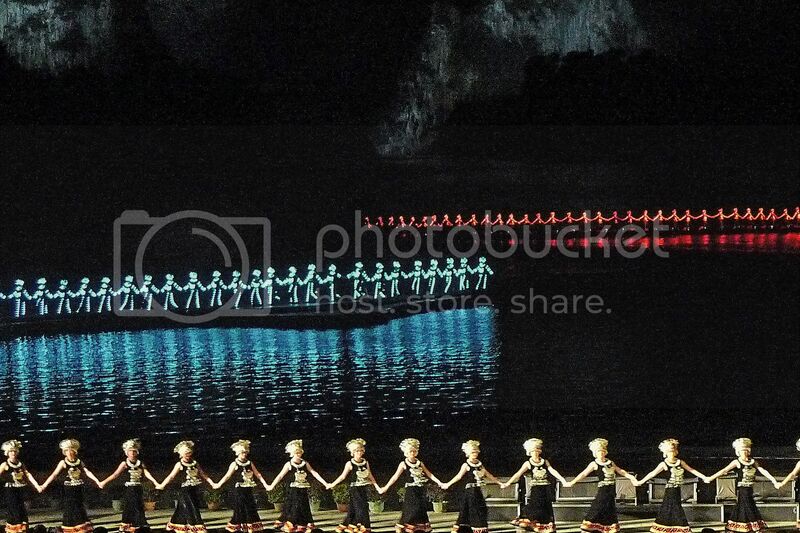 i've heard a lot about the Liu Sanjie performance.. but then i never know this one in Guilin is performed outdoor by the water!!! OMG!! it's really a nice experience to watch such a performance.. execellent and amazing!! and more than 600 performers!! wow, it's a lot more grand than most of the broadway and west end musicals..
i like that, i really like this performance.. i also want to go there and watch!! Impression shows are popular in China. I watched an Impression show in Haikou too...by acclaimed director Zhang Yimou and others. 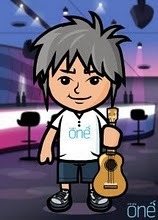 A thumbs up performance...which I think can hardly be replicated here...in the local context. very awe-inspiring. it must be a treat to see these performances with your own eyes. I thing you have enjoyed a lot while visiting their. thank you for sharing your experience. Wow! The shows really looks grand!!! 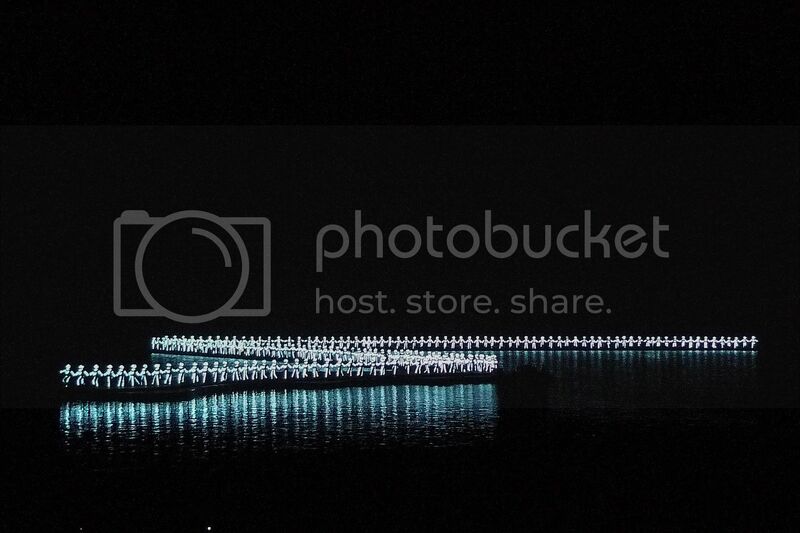 You ended your Guilin posts with a bang! That's beautiful, very impressive indeed. Oh yeah foong I have =yet to post a drawing I made bit inspired from this trip you had. Wow very impressive. The 'real' background is already so stunning. It is one of the most fantastic thing that I have ever found in any blog. The pictures you provided were really superb and I must say that you are lucky enough to to a part of such a wonderful thing. I Discovered CN Blue In Bangkok!